RP29827BL is rated 2.8 out of 5 by 6. Rated 1 out of 5 by Melindalf from Cheaply made and not brass as advertised This product is grossly overpriced. It is a piece of black plastic painted with oil oil rubbed bronze paint. I can’t imagine that it would hold up for any length of time. Rated 5 out of 5 by Happy from Worked Great! This was a cover I bought....much less expensive here and was the actual Delta product....matched the brushed satin in regular Delta products! Rated 1 out of 5 by arwen521 from Plastic This is just a piece of plastic. Even the braces that come with the package are plastic. Extremely disappointing for the price of this thing. Rated 4 out of 5 by CampbellHouseRemodel from Great 3-Handle Shower Upgrade Delta Remodel Plate was easy to fit and worked well with Grohe 35 015 OOO Pressure Balance Valve. The old 3-Handle Shower valves were worn out. The Delta Plate was the perfect answer to cover the holes in the tile for the old hot and cold valves. 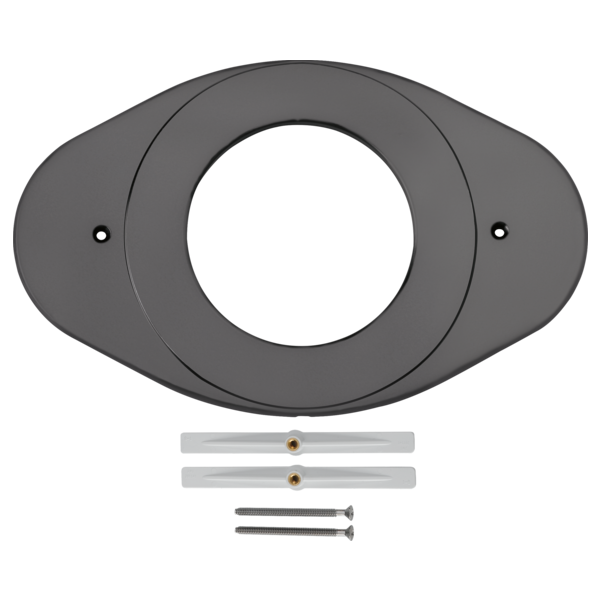 The center hole in the Delta Plate is large enough to work with a wide range of valves and trims. Rated 5 out of 5 by augur42 from When you need one, you need one A little pricey for what it is, but if your converting from and old two facet shower to the new single facet showers, you have to deal with the old holes somehow and this is a perfect match for the new installation. Will the shower kit 144996-BN work with this cover plate? Thank you for your question. Delta Faucet model # RP29827SS will work with Delta Faucet model # 144996-BN to cover up existing holes. will the renovation plate RP29827 work with the R22000 valve trims? Is it possible to get just the screw anchors/brackets? Will this cover plate work with the Delta Victorian Venetian Bronze 1-Handle Tub &amp; Shower Faucet Trim Kit with Multi-Function Showerhead? Any plans on manufacturing the Shower Renovation Cover Plate in additional finishes? Specifically, Champagne Bronze, so the cover plate would match the other fixtures I wanted to install? Thank you for your question. Delta Faucet model # RP29827 is non-metallic. Will this work with a T17492-SS trim kit?